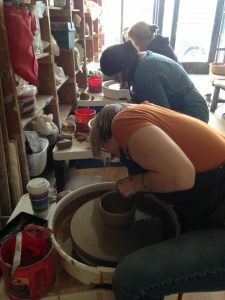 You are here: Home » Uncategorized » Special Valentine’s Day Date Night in the Pottery Studio! Special Valentine’s Day Date Night in the Pottery Studio! Studio 550 is excited to host a special Date Night in the Pottery Studio on Wednesday, February 14th in celebration of Valentine’s Day! Date Night workshops are normally only held on Fridays and Saturdays throughout the year. For Valentine’s Day we will be hosting sessions at 6PM and 7:30PM. This means you’ll have plenty of time to enjoy dinner before or after the workshop. 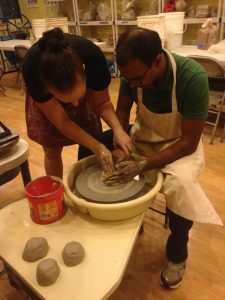 Couples in attendance will be given a demonstration of the basics of throwing on the wheel and then given their own pottery wheels to play and create on, with the assistance of a trained instructor. No prior clay or wheel throwing experience is needed. To make this evening even more special, Studio 550 is partnering with Apotheca Flower Shoppe, in Goffstown, NH so couples will have the option of purchasing a beautiful and unique bouquet of flowers while they are here. A limited selection of the artistic creations will be available at Studio 550 for that evening only. Space is limited to four couples each session, so participants are asked to reserve in advance. We look forward to making Valentine’s Day even more special & fun for all couples!